Study on Songahm TKD sparring matches - Wide count ranges? I regularly scan through google scholar for papers and training studies related to TKD, and I came across this study on physiological responses and other correlations in STF (Songahm TKD Federation, which used to be the designation for the South American branch of the ATA). They don't say the event, but label it as a "Major event" for Brazil, which probably means our Pan American tournament. Speaking from experience at Worlds, the SA contingent comes to play, and they play hard. 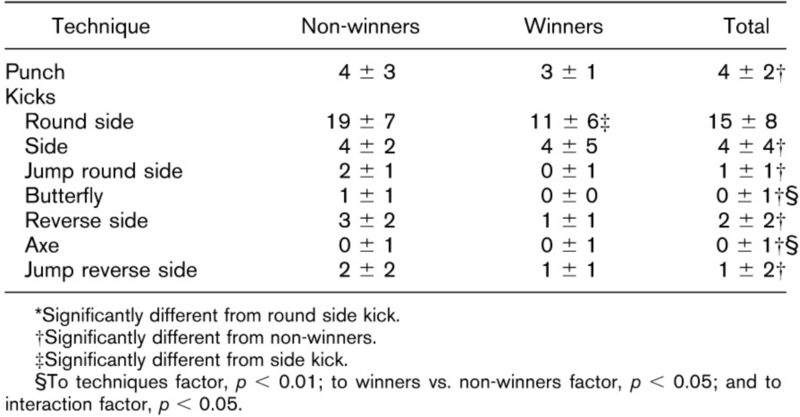 I was looking at some of the kick correlations and counts between the "winners and non-winners" as they label them, and it's labeled as 19, +/- 10. So as low as 9 and as high as 29. With two minutes per match (And I believe all matches went to time rather than the 5 point limit), isn't that a range that is so wide as to be statistically meaningless? Or is there some other interpretation that I'm missing? The high variance is not an issue for determining that winners use fewer techniques than non-winners. This difference is reported as statistically significant (p < 0.05); there are enough observations to make the this claim. Match winners use a mean of 19 techniques, with a standard deviation of 10. Match non-winners (their term) use a mean of 35 techniques, with a standard deviation of 10. Because +/- term is in standard deviations, there may be matches where a winner uses fewer than 9 techniques or more than 29 techniques. I would also call the difference of 16 techniques between winners and losers practically significant. It isn't the case that the difference is small and statistical significance is achieved by making a huge number of observations. This table is derived by looking at the winners and losers of events. Each winner is analyzed to determine which techniques they used to score and their count. So for example, a winner might have scored 3 points by round kick, one point by side kick, and so on. Then for all the winners, they look at the distribution of points scored just using the round kick. And they then derive the median and standard deviation. Those are the numbers you see in the table, I believe. They do the same for each type of kick in the table. And then they do that for losers as well. Totals are shown also. In that case, it's lumping both the winners and losers together and doing the same analysis. By the way, don't confuse error margin with standard deviation. The two are not the same. The median values are what you should probably take away from this. If you do that, you'll see that round kicks win at a rate of almost 3 times that of side kicks. Another thing to glean from the data is that the point count is actually less with the winners than the losers. That means that winners are more precise, throwing less techniques but scoring more. And finally, you can also see that the winners almost never use anything other than round kick and side kick. Whereas the losers are throwing a larger variation of different kicks. This data confirms what I've said before: here and here. In short, if you want to win, you should focus your training on the fastest, simplest, most direct techniques you have. These are techniques that can be used in the most situations and which can be done quickly and with the least risk should things go wrong. You do not want to use techniques that aren't direct, leave you in jeopardy, or take extra time to execute. For example, the butterfly kick requires time to setup and execute, resulting in telegraphing what you're doing. It also puts you in jeopardy, because your head is brought down low into the path of kicks, while your hands are nowhere near your head to block. Any sort of spinning kick qualifies here as well. You're taking your eyes off your opponent, even if it's just for a moment. You're unbalancing yourself and possibly making yourself dizzy and disoriented. And you're taking extra time to do it. Fatigue is also something to consider. The techniques that have a lot of superfluous movement (aren't simple, quick, and direct) will cause you to use the most energy. That can increase muscle fatigue which reduces accuracy, speed, and power. One other thing. The kicks listed in the table are merely a description of what happened and shouldn't serve as a prescription for what you should train. It's just one particular event, so it may not be representative of TKD as a whole. Also, it looks like the table is not complete. In particular, the front kick is missing from the data. Did nobody win any points by front kick? I'm pretty sure they did, but the table just doesn't list it. Bottom line: What's most important is the general concept I laid out above: Stick to simple, quick, direct techniques if you want to win. Not the answer you're looking for? Browse other questions tagged tae-kwon-do sparring or ask your own question. How to defeat a much stronger and bigger opponent? What is the best point-scoring technique? What are the key changes when moving from TKD-based point-break to continuous sparring? is Jun Chong TKD a legitimate TKD dojo for self defense?